Nearly half the places swabbed contained levels of bacteria or yeast and mold that could put someone at risk of infection. 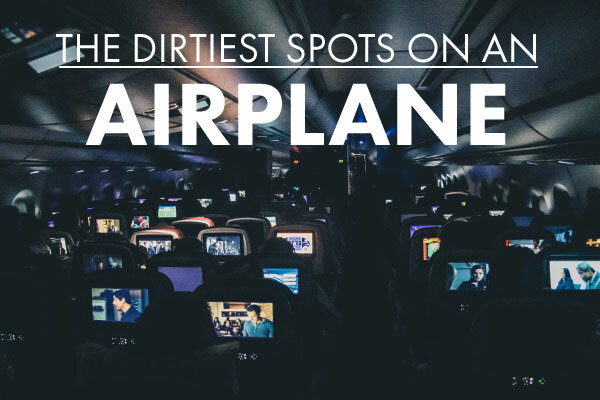 The most contaminated and germ-riddled surface was the headrest where they found staph and hemolytic bacteria. In this case, washing your hands won’t keep germs at bay when travelling, and it might be a good idea to pack some antibacterial wipes in your carry-on to give the headrest a quick cleaning before settling in! The second germiest place was the seat pocket in front of you. When flight attendants were interviewed, there was completely unsurprised as they’d witnessed travellers using the seat pockets as their personal trash bins sticking everything up to and including dirty diapers! This could explain why traces of E-coli bacterial linked to symptoms like diarrhea, vomiting, and abdominal pain was found. It’s probably not surprising to hear that seatbelt buckles contain high concentrations of bacterial, since every passenger touches the buckle at least twice while on board. Although airplane washrooms are cleaned regularly there can still be bacteria and even E coli lurking on some of the sinks, flush handles and toilet seats. Wash your hands thoroughly and use paper towel on the door latch when exiting the washroom. Tray tables were found to have eight times the amount of bacteria per square inch, as compared to the washroom flush handle. So, the next time you board a flight – trust in antibacterial wipes and gives theses surfaces a quick wipe down before settling in.